Use the form below to inquire about Estate Bungalow at Madikeri . Use the form below to reserve for Estate Bungalow at Madikeri . The tranquil setting of the Estate Bungalow at Madikeri invites you to rejuvenate your mind and soul in nature’s lap. With the most diverse flora and fauna, Coorg (also known as Madikeri) is undoubtedly one of the best places in India where you can be one with nature. The rolling hills of the Western Ghats offer breathtaking views of lush, verdant landscapes from almost anywhere in the city. The valleys are carpeted with dense forests and speckled with coffee, pepper, and tea plantations. The different shades of green all around the region are a treat to the eyes. Away from the hustle and bustle of the metros, the Estate Bungalow at Madikeri calls this rich landscape home. The Estate Bungalow at Madikeri is located on a 12-acre estate with working coffee, cardamom, and pepper plantations. Lush tropical forests play host to the guest house and the plantations. The estate grounds are teeming with life in the form of colorful wildlife and birds. The guest house at the estate is eco-friendly and built using indigenously available construction material to conserve the habitat around. 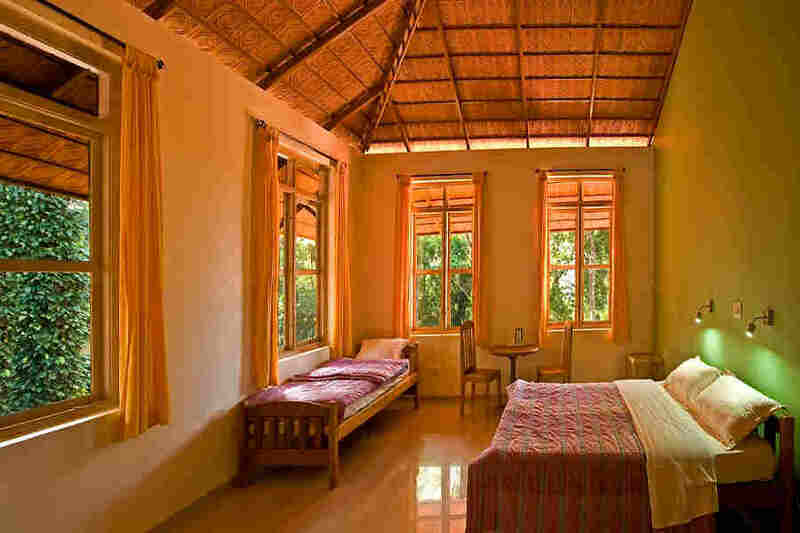 None of the rooms have Internet, TV, and cable so that you can enjoy nature to its fullest without any distractions. The estate guest house keeps its guests’ appetite in check with satiating buffet style vegetarian meals. You can also enjoy a variety of non-vegetarian dishes and snacks here. Breath-taking vistas, serene ambiance, and delicious food – what more do you need to enjoy your laid back moments? The accommodation at the Estate Bungalow at Madikeri is several cuts above the ordinary. There are nine rooms divided into five types. Room Type 1 has spacious split level rooms that can accommodate four people with a double bed and two single beds. They offer spectacular views of the Kabinakadu Valley. Room Type 2 accommodates three people in its split level rooms that face the estate’s plantations to the west. The spacious rooms of Room Type 3 can accommodate three people. They have a double and a single bed and face the plantations toward the south. Three people can stay in the rooms categorized as the Annexe Room Type 4. These rooms have one single and one double bed. How about waking up in one of these rooms where you can breathe in the fresh air coming from the surrounding plantations? Heavenly, isn’t it? Meals are served at fixed timings. Non-vegetarian dishes and snacks are available on prior request. All rooms have attached toilet/bathroom facilities with hot water supply(solar). TV/Cable is not a provision in any of the rooms. Music or noisy reveling is strongly discouraged in view of the larger concern for other guests and the tranquility of the estate. Mobile signal strength is good in the Estate Guest House and weakens further along the many trails into the plantations. Internet connectivity is not a provision. The Estate House has Internet access for emergency need. Guests are requested to respect Chingaara's eco-friendly efforts/regulations to conserve and nurture the surrounding habitat. Check In - 12 pm / Check Out - 11 am. Rooms can be reserved by paying 50% of the total package amount within 48 hours of booking. Bank account details shall be provided once you positively confirm your wish to reserve a room. Booking cancellation within 7 days (168 Hrs) - 100% Refund. Booking cancellation within 6 days (144 Hrs) - 50% Refund. Booking cancellation within 5 days NO REFUND. The Kodagu region is a nature lover’s and birdwatcher’s paradise. The area in and around the property is a haven for diverse flora and fauna. To explore the wilderness of the region, you can go birdwatching or on a nature walk. Look for the many inhabitants of the forests and many species of ferns, mushrooms, and other plants that are endemic to the region. The region is also a trekker’s delight. The rolling valleys provide great opportunities for some of the best treks. There are also many sights near the guest house that are must-visits. Trekking Tadiandamol, one of the highest peaks in Karnataka, are on most trekkers’ wish list. Beautiful streams and waterfalls are added incentives to wear your trekking shoes and head out into the wilderness. Do you want to spend your evening doing something that you haven’t done since your childhood? Explore the night sky in a star-gazing session! Or how about enjoying the warmth of the fire and spending delightful moments with your family or friends? All you need to do is to put an advance request for the bonfire. When you are at a place where nature is at its best, can there be any dearth of activities? We doubt it! The closest airport from the property is in Mangalore (154 km). The international airport in Bangalore (294 km) connects the city to many domestic and international destinations. Mysore Junction (117 km) is the nearest railway station from the property. Other major railway stations include Mangalore (138 km), Kannur (172 km), Kozhikode (200 km), and Bangalore City Station (245 km). Mysore (120 km), Mangalore (140 km), and Bangalore (265 km) are a scenic road trip away from the property. Some of the nearby tourist attractions in Kerala include Wayanad (126 km) and Kannur (172 km). The last 2.5 km leading up to the guest house should be tackled only with a 4-wheel drive jeep.